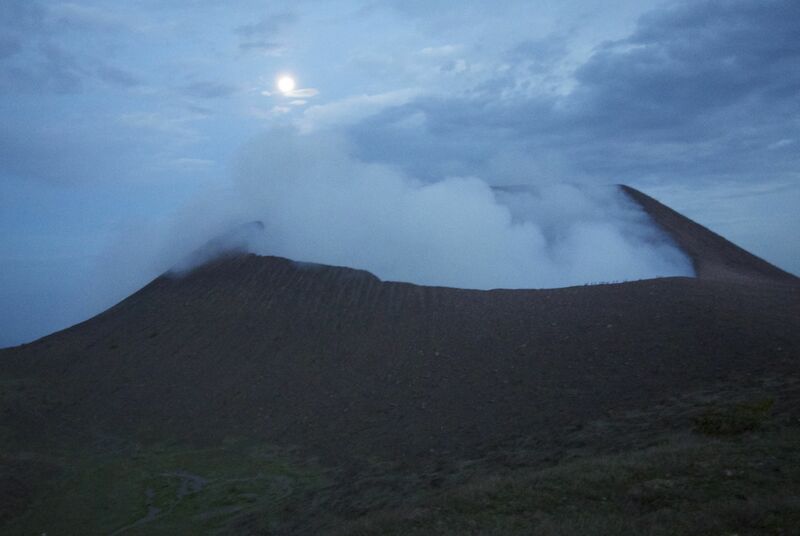 It is sometime around midnight and I’m on a volcano. There are 40 of us, some with headlamps, others without. The light of the full moon seems sufficient, save the millions of stones and rocks that we trip over going up. Most of the hike, however, it doesn’t feel like we’re going up at all. Telica Volcano is about a half hour drive from Leon, Nicaragua. With Queztaltrekkers, a non-profit that works with local kids and takes gringos on treks, we pile into the back of flatbed trucks as the cool night air provides some relief from this impossibly hot climate. Like a herd, we stomp through the farmland. Even though it is dark, the heat is oppressive. I sweat through my shirt before we even start the major uphill climb of the hike. Over the course of 12 hours, I will have drunk four liters (about 135 ounces) of water. Despite our size, the group is fast. Under a mango tree at our halfway point, we rest with snacks and water. The final climb to the base camp takes about an hour and a half. This is the only legitimate hiking we do the entire time. We climb uphill as the group in the front dwindles with each switchback. We walk by a grouping of tents at the base camp where others are sleeping. People in our group say things like, “Are there people sleeping in there?” and wake them up. I know this because a few days I later I’m asked, “Were you those fuckers that walked by our tents and made all that noise?” Yes. As individuals we may be intelligent, thoughtful beings. In a pack of 40, we are as dumb as a pack of mules. We light a fire as everyone rests. I ask if anyone wants a swig of my rum. No one. A few minutes later, I ask again, as I sip on my rum. There is a fire, a cool breeze, we are on a volcano, but no one else wants rum. I enjoy myself, alone. After our rest, we hike the remaining way to the edge of the volcano. It is smoking and the sulfur it emits makes us cough and our throats tingle. The smell is like rotten eggs cooked in ethanol. I cover my nose and mouth with a bandana, which helps. People lay on their stomachs to look over the edge, seeking lava. We were promised lava. Of course, I pictured abundant streaming molten lava when signing up for the trip. In reality, we squint down into the volcano and see glowing orangish red through the billowing smoke. People snap pictures in vain. From the eastern crest, we watch the sun rise. Before it gets to hot, we start back down. We see all the rocks we tripped on and curse them as people fall on their asses. The heat is impressive. At the bottom by our rides home we see the hot mud springs. Some previous trekkers have been severely burned from falling in. We keep our distance. The ride home is cool from the breeze. Most nod off and wake when we get back to Leon for breakfast. We all get our free quetzaltrekkers t-shirts and part ways. This entry was posted on June 26, 2013 by alexjparton. It was filed under Americas, Nicaragua, Travel and was tagged with full moon, hiking, leon, nicaragua, night hike, queztaltrekkers, rum, telica, trekking, volcano.